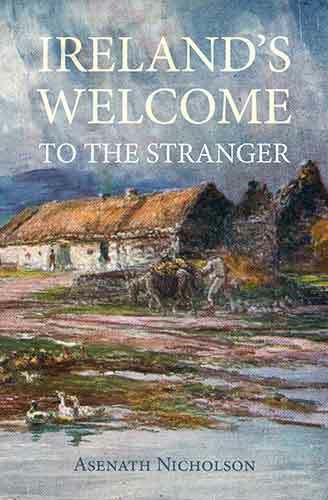 SIR,--Returning, a few evenings since, from the seashore, to the village of Raheny, my attention was attracted by a stone, carved in the manner represented above, built into the angle of a cottage belonging to George Papworth, Esq., architect. On inquiring, I found its origin was unknown, and that it had occupied its present situation time immemorial. 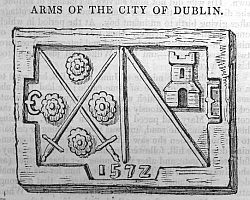 I have since ascertained that it marks the boundary of the county of the city of Dublin, and was probably placed there to designate the extent of the Lord Mayor's jurisdiction in this direction. The arms represented are those of the Howth family (lords of the soil), viz. : argent two swords in saltire between four roses gules seeded vert, empaled with another escutcheon, bearing a bend or bendlett, with a tower in the dexter chief of the field--perhaps the ancient arms of the city of Dublin--the date 1572--the initials C. E. meaning, I suppose, Civitas Eblana.